Facebook is loved far and wide by scammers. It’s a great pool of an almost unlimited amount of victims, most of whom are gullible enough to fall for the most simple scams. Shooting fish in a barrel! Better yet, a bunch of these Facebook users are “endorsing” the scam giving it even more credibility. Incredible isn’t it? “Facebook changes its look and functionalities often, but a lot of users dislike any kind of change. This normal human tendency is often misused by scammers who offer bogus Facebook Timeline deactivation options. What’s in it for the creators of malware? 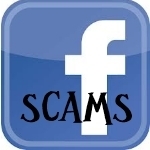 Here are popular Facebook scams you should watch out for….